I plan to read your #1 and 4, I actually downloaded #4 a while ago. These are kind of like mini reviews in and of themselves so don't feel pressure to review them fully (unless you need to). I'm so curious about McCracken. I have The Giant's House and my Nook and Kim from Sophisticated Dorkiness just read a memoir by her. I feel like I'm seeing her (and praise about her writing) everywhere! I was hammered by Ruby, loved Casebook, and am still trying to find words for The Marrying of Chani Kaufman. 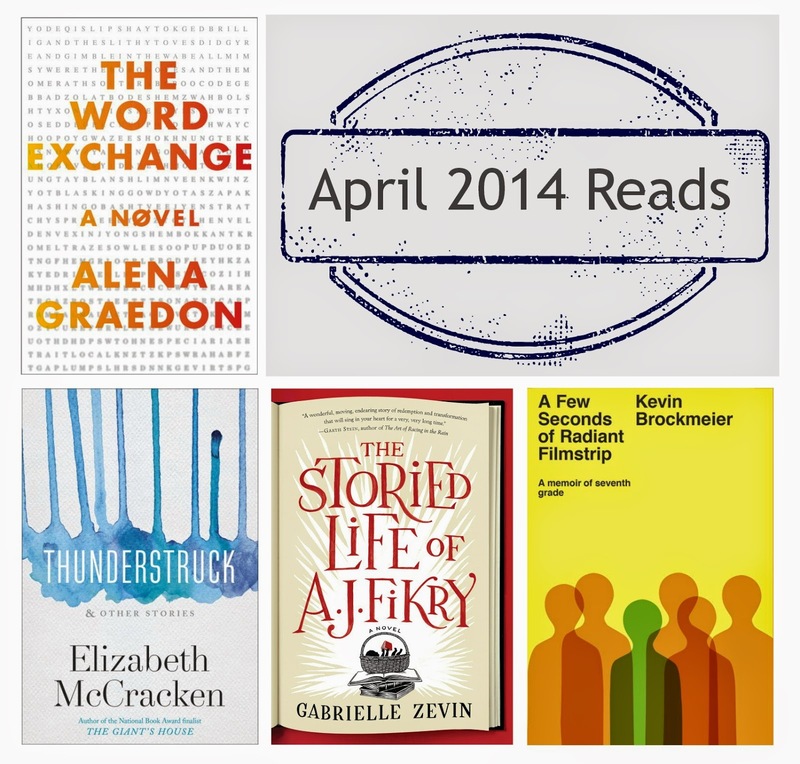 Such a busy book month and May is starting out the same way. I really need to read A.J. Fikry. Can't believe I was in a bookstore and too ka picture of a happy cat sleeping on top of copies but did not buy the book!! And just to be persnickety (I know you expect no less) we're usually all about the rain here in Seattle but it's been in the high 80s for the last 3 days and I'm sick of it. Makes me cranky! I want to read Ruby! I have it on hold at my library (still trying this stop-accumulating-books thing, with moderate success). A.J. Fikry is excellent (and short, so hopefully you can squeeze it in!). It finally stopped raining here and the sun is shining and all is good! Though they are calling for more rain tomorrow... I don't think our soaking wet ground can take any more. Thanks! Sometimes I really like reviewing books I love, and sometimes I love a book so much I can't quite find words for it. I didn't realize McCracken had a memoir out, but I'll have to look for that. The Word Exchange is a whale of a read, but there is certainly a premise you have to buy into. Graedon does a good job of setting it up, I think--one little step at a time, the population becomes more and more dependent on their devices and less and less dependent on the printed word. Which definitely got me thinking. How many times have I wondered, "What did people DO before cell phones!?" Both are excellent books-about-books, though they couldn't be more different! The Word Exchange and AJ Fikry seemed to be the big books of the month and I suspect they will be big for a while. I picked up a copy of The Word Exchange but I've not started it yet. Hopefully soon, or perhaps I will save it for summer vacation. AJ Fikry was a really fun read for me. My favorite book that I read last month was a re-read of Eleanor and Park by Rainbow Rowell, but my favorite new book was probably The Rise and Fall of Great POwers by Tom Rachman. I have Eleanor and Park on audio to start after I finish Mindy Kaling's book on audio (which is fun and easy and I needed something not so heavy after finishing An Untamed State). Agreed! Seeing lots of buzz about both. They are books for book people, though very, very different in how they approach that.